The culinary scene in Miami is rich and diverse. The city is synonymous with flavors from across Latin America and the Caribbean Islands. On your travels to Miami, take a culinary journey and explore the local flavors. Open up to new and exciting Latin food experiences. 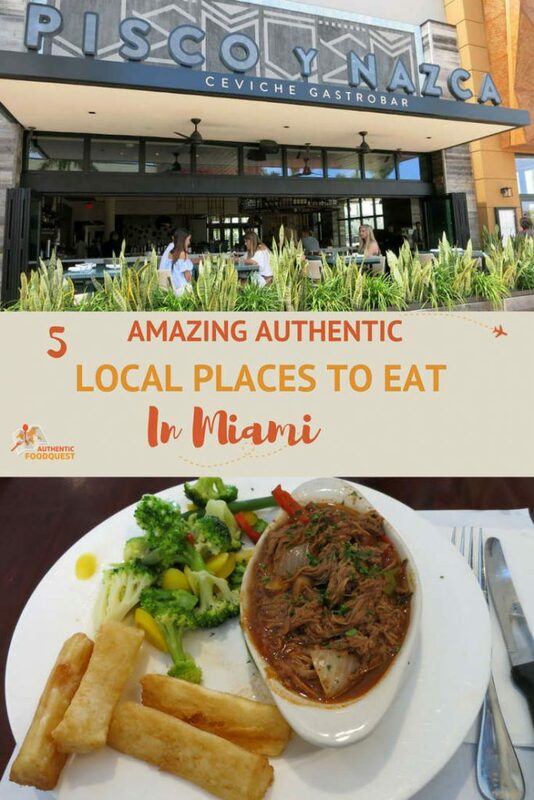 At Authentic Food Quest, our goal is to help you discover the local specialties and invite you to open up to new tastes., so Expedia.com asked us to share our list of local places for travelers to check out during their Miami vacation. Make your vacation to Miami unlike any other. Even though, Miami offers plenty of outdoor activities in the sun, sand and water (see more things to do in Miami at Expedia.com), the food is not to be missed. 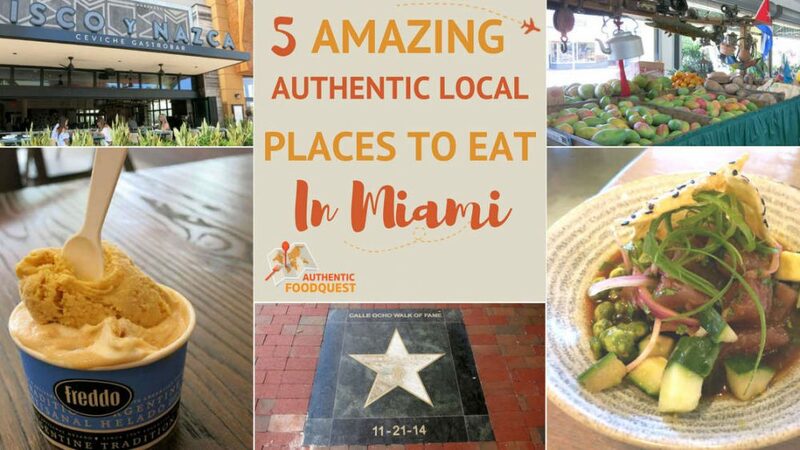 On your upcoming travels to the Magic City, “taste” Miami and enjoy Latin flavors at any of the authentic and local places to eat in Miami. Cuban cuisine is a must try in Miami, where more than half of the population is Cuban-American. Little Havana and the famous Calle Ocho is at the heart of the Cuban-American community in Miami. Find many Latin-influenced shops and Cuban restaurants. A visit to Calle Ocho is one of the best ways to immerse yourself in the local Latin culture and savor Cuban flavors of Miami. El Exquisito restaurant makes for an ideal stop for a Cuban lunch as you stroll the famous Walk of Fame on Calle Ocho. This traditional family-owned Cuban restaurant, opened in 1974, is one of the best local places to eat in Miami. They pride themselves in serving “grandmother’s food”. The restaurant is filled with regulars and locals and most of the conversations are in Spanish. Soak in the Cuban atmosphere, with the posters on the walls of Cuba and Little Havana as you dive into the menu. On the menu, find classic Cuban fare such as Ropa Vieja, a Cuban-style beef stew, sweet plantains, Lechon roasted or Cuban roasted pork, Cubano Sandwiches and more. Known as one of the “best Cuban restaurant” in Miami, El Exquisito restaurant is a must try on your culinary tour of the Latin flavors in Miami. At Los Pinarenos Fruteria, locals find the fruits and vegetables to prepare their next Cuban meal. With signs in Spanish and a large Cuban flag flying in this open-air store, you’ll feel as though you’ve been transported to Cuba. This local joint also makes excellent fresh juice on the spot. 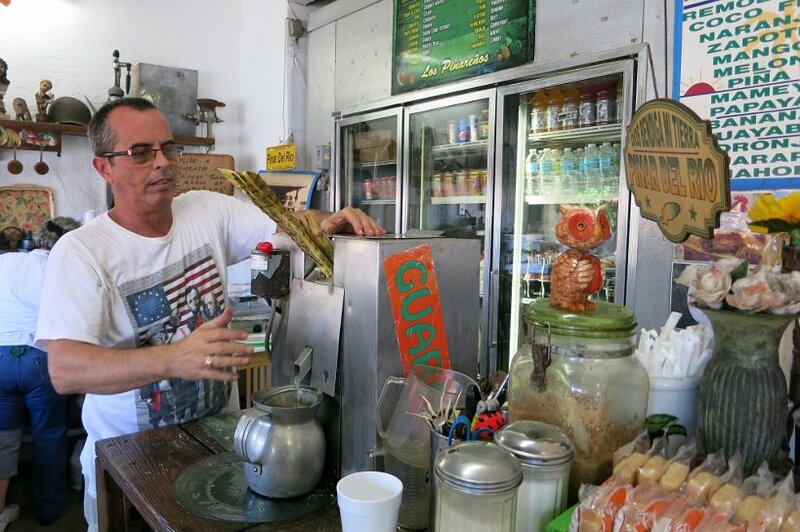 You can get fresh sugar cane juice directly from pressed sugar cane plants. Or, you can also treat yourself to fresh coconut juice directly from the coconut. Cool off at this refreshing stop as you visit Calle Ocho and other famous landmarks in Little Havana. 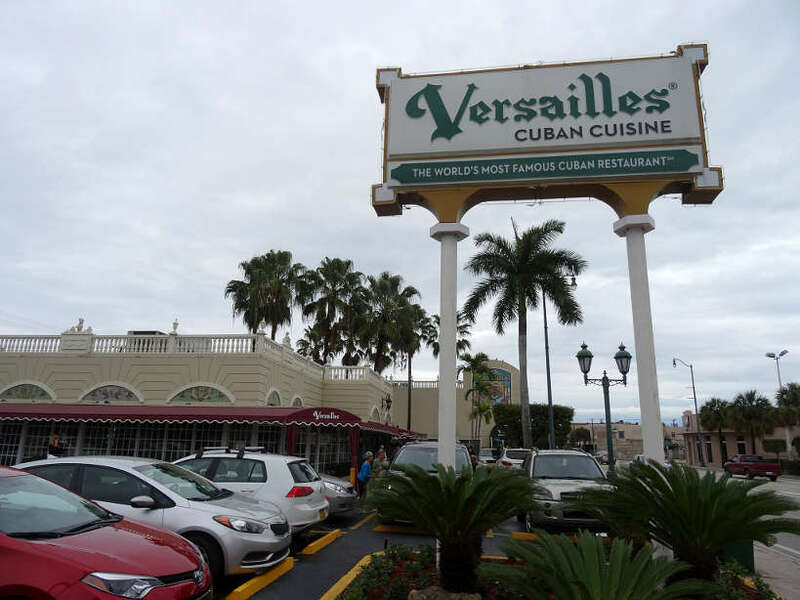 A little further from the main part of Calle Ocho, is Versailles, one of the iconic restaurants of Little Havana. This large restaurant with a bakery attached has been serving locals and tourist alike since 1971. Although its name might suggest a link to the famous Château de Versailles in France, the French comparison stops there. The main draw to the restaurant is the strong, sweet Cuban coffee served with Cuban pastries for breakfast. Versailles also has a full menu for lunch and dinner featuring local favorites like croquetas, Cuban sandwiches or generous portions of traditional Cuban dishes. You can taste Moros, a Cuban mix of beans and rice, Cuban style shredded chicken and other Cuban staples. When in doubt, try one of the samplers, to give you a roundup of Cuban specialties on one plate. Versailles restaurant is not only popular for the Cuban cuisine but also for its political significance. This is where Cuban exiles and anti-Castro gather and express their opinion on anything about Cuba. It is also where the U.S politicians come to seek the Cuban vote. La ventanita or their walk-up coffee window, is the place to go for locals to connect and have lively conversations with “Cuban bites”. Join the locals at this iconic restaurant and savor everything Little Havana has to offer. Just a few miles west of the Miami International Airport, is the City of Doral. This hidden gem is one of the fastest growing areas of Miami, popular for golfing and shopping. Golf champions such as Tiger Woods, Jack Nicklaus, Phil Mickelson, and more have all been known to play at Doral’s PGA-level golf courses. Doral, is also home to Miami’s largest mall. You can enjoy affordable shopping at Dolphin Mall, which has more than 240 stores. However you choose to enjoy your time in Doral, you want to take the time to explore Latin flavors at two of our favorite spots. While on our quest for authentic food in South America, we fell in love with the amazing tastes and variety of flavors found in Peruvian cuisine. We even wrote a book called, Authentic Food Quest Peru about the local cuisine and regional specialities in Lima and Cusco. 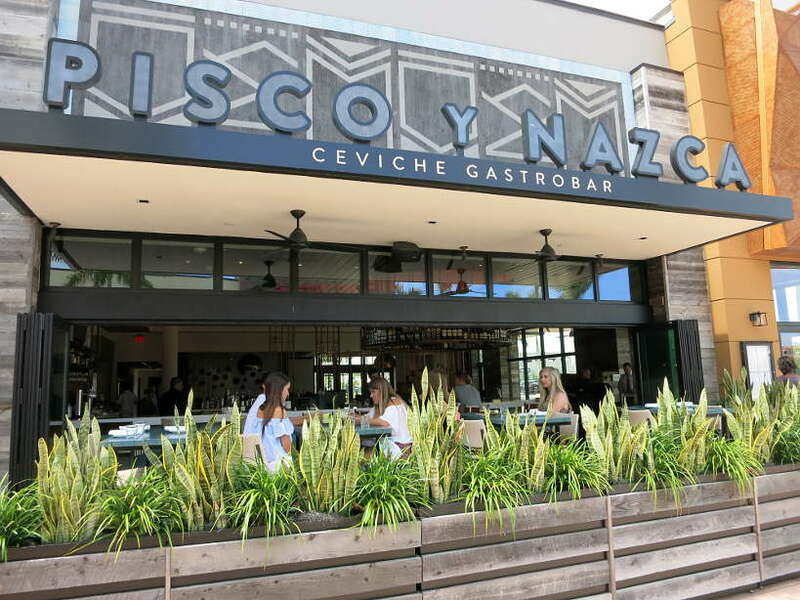 Pisco y Nazca, is a modern ceviche gastrobar and one of the best restaurants in Doral for authentic Peruvian food. The executive chef, Miguel, originally from Peru has created a unique menu featuring ceviche and shareable plates. On the menu is one of our favorite Peruvian cooking styles, Nikkei, which is a blend of Peruvian and Japanese flavors. If you’ve never had Nikkei cuisine, we highly recommend trying the ahi tuna Nikkei. This light starter is made with ahi tuna, mirin, soy sauce, wasabi peas, cucumbers, canchaca, leche de tigre and topped with a wonton-sesame crisp. The sweet and spicy flavors and the delicate flavors of the ahi tuna, transported us back to Peru, where we first had Nikkei cuisine. While in Doral, don’t miss the authentic Peruvian flavors at Pisco y Nazca. This fun and casual restaurant is the perfect place to end your day in Doral. If you have never tried Argentinian ice cream or helados, you are in for a real treat. Freddo makes authentic Argentinian helados and even imports some flavors from Argentina to the U.S. While in Argentina, on our quest to discover the local specialties, we were surprised to discover a huge Italian influence in the country. Argentina has perfected the art of making ice cream or helados. 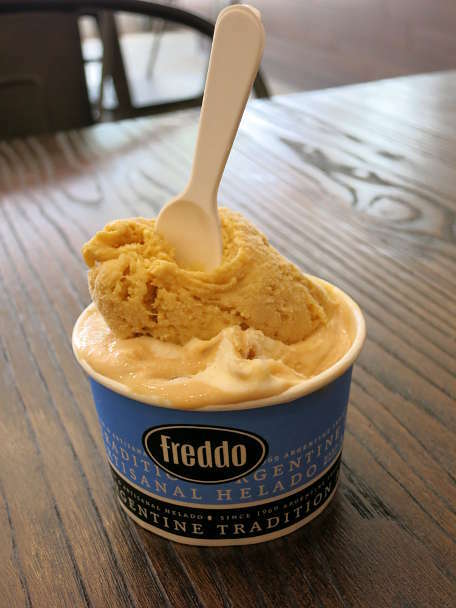 Freddo makes artisanal gelato using only fresh and natural ingredients, free of any artificial flavorings, coloring or preservatives. Be sure to order dulce de leche, Argentina’s most popular dessert flavor. Stay cool and refreshed in Miami with authentic ice cream from Argentina. The local flavors of multicultural Miami, are beyond a doubt, one of the best ways to experience the city. 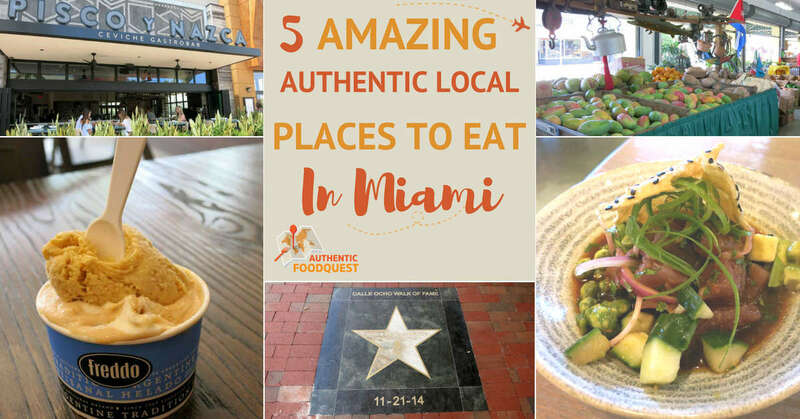 Getting off the beaten path and seeking out the local eateries and restaurants is another fun way to discover Miami. The rich Cuban history of Calle Ocho and landmark restaurants like Versailles, will introduce you to more than just Cuban cuisine. A culinary journey through Doral, Miami, will introduce you to a new part of the city and local places to eat serving delicious South American flavors. Add Latin flavors to your trip to Miami and enjoy a unique and delicious vacation. Have you been to Miami before? In the comments below, tell us what is your favorite local place to eat in Miami? You are most welcome Helena!! Happy to help guide your culinary travels through this amazing city with diverse local foods 🙂 Appreciate you stopping by. Honestly I’ve never tried Latin cuisine before, other than Salsa dip in Doritos. We don’t really have nice Latin restaurants here in the small town I live in Indonesia. Besides I always say to myself, I’ll wait until I explore Latin American countries because I really want to taste their authentic food. Reading your post made me realise that I will need a bigger tummy when I hit Latin countries! Or maybe I should explore Miami first? Cuban roasted pork, Cuban sandwich, Cuban pastries and Argentinian ice cream…..everything sounds delicious I really can’t decide which one to try first, lol. You can’t go wrong in Miami for delicious Latin flavors. Definitively worth seeking out Latin food at some point. Hope your travels take you to Latin America or Miami soon. You’ll love the food 🙂 Cheers. How I wish this list was with me in Miami a few years ago. I was traveling with less adventurous family members so we never made it to Little Havana. Would love to stop at each of these places!! Then dance it off! You are right Elaine, eat some and then work the rest off 🙂 Keep this guide handy for your next trip. It’s worth making it to Little Havana at some point. You’ll love it!! Thanks for stopping by. I’ve heard raves about the Cuban food in Miami, and now I’m even more excited about the possibility of trying it. Plus, now I know there is a great Peruvian place for me to sample! It’s funny because I live near two Cuban restaurants called Versailles. I wonder if they are related? Of course, they don’t seem to have the political element that you mentioned in the Miami version. Thanks for sharing! That’s amazing that you live next to two Cuban restaurants named Versailles! What city/town? I think the one in Miami is really special and very historical too. Given your proximity to two Cuban restaurants, you have to try the food. Get the Cubano sandwich and finish off your meal with Cuban coffee. You will love it!! Do let us know what you think 🙂 Cheers, Patricia. We are in Miami quite often. So I have saved this for our next visit. We would definitely be checking out the Cuban coffee at Versailles. Peruvian ceviche would be a great things to try. And we would love to finish up with Argentinian ice cream. Dulche de Leche is definitely my flavour. Thanks for some new options for our next trip. You are most welcome Linda. Not only will you enjoy these off the beaten path spots, you’ll also discover new neighborhoods in Miami that are fun to explore. Do let us know what you discover when next go to Miami. Cheers. I love love love Cuban food, so I’d definitely have to hit up Versailles for starters at least. Unfortunately as a vegetarian it can be a bit hard to find things I can eat — so much pork — but even if I could only get a proper Cuban coffee, it’d be worth it. The Cuban coffee is worth an experience for sure. And you’ll find most restaurants willing to adjust the menu to meet you dietary needs. So don’t hesitate. What’s your favorite Cuban food? Cheers, Carrie. How interesting that more than half the population of Miami are Cuban-American. I agree, Versailles is an unusual name for a Cuban restaurant. However, I love the fact that it’s a meeting place for political activists and politicians as well as an eating place. No wonder it’s iconic. After feasting on some Cuban food, I won’t mind tasting the Argentinian ice-cream from Freddo either. There are so many Latin places to feast in Miami. Your plan of starting in Cuba and then finishing off in Argentina is a great plan. I would highly recommend passing through Peru as well 🙂 Appreciate you stopping by Linda. I love authentic food and local food as well. I’ve never been to Miami so this is so new to me. But really got curious about the sweet and spicy flavor of Ahi Tuna, seems like Peruvian food is such an interesting dish. So glad you enjoyed the article. Miami has a lot of amazing Latin inspired dishes worth exploring. 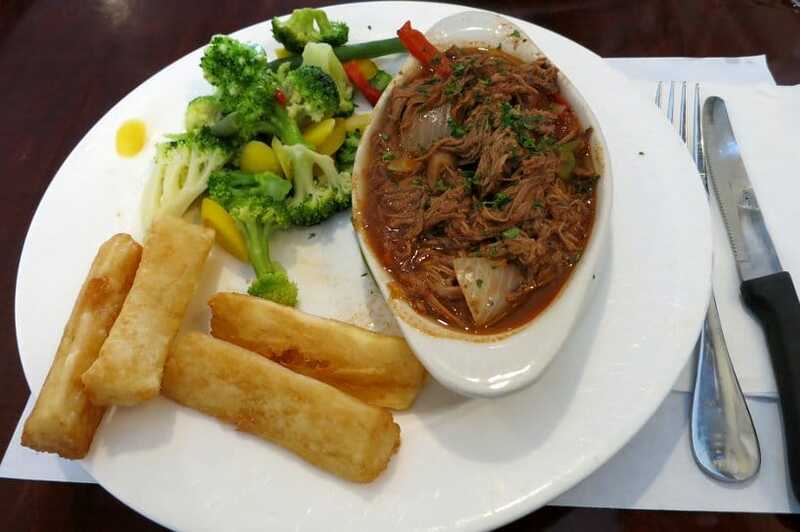 If you haven’t had Peruvian cuisine, we highly recommend it. Japanese -Peruvian food called Nikkei is simply outstanding. Do check out a local Peruvian restaurant in your area and be prepared to be amazed. Thanks Ferna for stopping by. The Peruvian restaurant got my attention. What other dishes did you order? Were the empanadas and Butiffaras great? Im Asian but always a big fan of Peruvian cuisine that I make some at home! Thanks Kirstie, we are huge fans of Peruvian cuisine as well. We have an article that goes into more depth about the experience at the restaurant. Check out the website under “Peru” for more delicious stories about the food. What Peruvian dishes do you make at home? Thanks for stopping by. I love eating my way thru Little Havana. I love all the flavors and spices. I wish more of the United States had great Cuban food. I love places I can get fresh sugar cane juice. I shouldn’t be surprised there is some great Peruvian food, yet I am. I can’t wait to try it next time I am down to Miami. Hold onto this guide Jennifer for your next trip to Miami. Love the atmosphere in Little Havana and not to mention the food as well. There are so many local restaurants with amazing Latin inspired food. Definitively try the local Peruvian food on your next trip. Cheers. Seems like a mini Cuba here. The restaurants that you described definitely whet your appetite for some yummy food. In fact, looking at those, am craving for some good food. Just curious though – what are the veg options here like? Great expression, like a” mini Cuba”, indeed!. As far as veg options go, you can always find vegetarian options as well as ask restaurants to adapt your meals and make them veg-friendly. You will not go wrong with Cuban black beans and rice 🙂 Cheers.